Youth development, social responsibility and healthy living are the focus areas that guide the work of the YMCA. Many people already know about the Y’s healthy living initiatives that include spaces to work, places to learn to swim and opportunities for kids to play sports. Eating well is equally important to healthy living. Yet, this can be challenging for many residents within low-income areas of Minneapolis—because they need to budget within a limited income, because there are plenty of low-cost food options that are low in nutritional value, or because it’s hard to access affordable and healthy options. Addressing these needs has been a focus for the YMCA, with critical ongoing support from the Cargill Foundation—including a generous gift that spans the next three years. 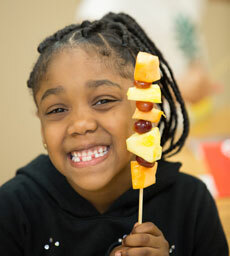 “The Cargill Foundation has a rich history of partnering with the YMCA to improve access to nutritious food and increase healthy food consumption that will enable our students to learn and thrive,” says Katie Clark Sieben, director of the Cargill Foundation. The roof of the North Community Y will be home to a greenhouse that allows kids, families and seniors to grow and cook fresh produce. With the new greenhouse, local kids will also have more opportunities to participate in hands-on learning. “The Cargill Greenhouse brings our efforts full circle—allowing children to learn STEM concepts through the growing process and how to prepare and eat nutritious food in the adjacent Cargill Teaching Kitchen,” Katie notes. The Cora McCorvey YMCA isn’t far from the North Community Y and is focused on helping adults ages 40+ to live healthier and more active lives at an inexpensive cost. The Cargill Foundation gift will help bring older adults from the Cora McCorvey Y to the North Community kitchen and greenhouse for education on healthy and affordable meals for smaller families.